Maximized RefinementAdvanced power and control are delivered on the 2017 Toyota Tundra TRD Pro with an enhanced design and improve durability. Through up to four-doors and a seating capacity for up to five, this truck means business, and business is good. 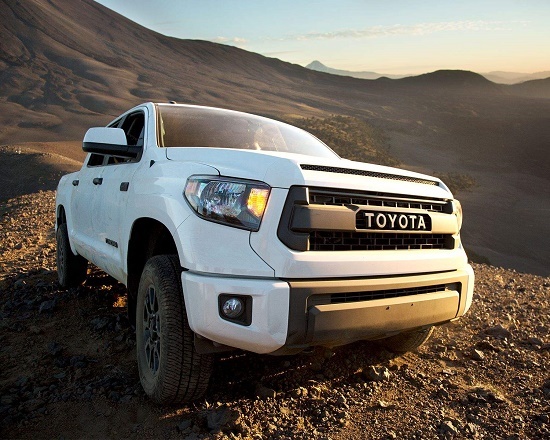 Available Tundra trim levels include the 4×4 Tundra DBL Cab SR 4.6L, 4×2 Tundra DBL Cab Long SR 5.7L, 4×4 Tundra DBL Cab SR 5.7L, 4×4 Tundra DBL Cab Long 5.7L, 4×4 Tundra CrewMax SR5 5.7L, 4×4 Tundra DBL Cab LTD 5.7L, 4×4 Tundra CrewMax LTD 5.7L and 4×4 Tundra CrewMax PLAT 5.7L. Relax in an environment of refined luxury and advanced ergonomics with the 2017 Toyota Tundra TRD Pro. Convenience features such as the available Keyless Entry and Garage Door Opener bring you smooth functionality. Through an exceptional interior layout with heated black leather seats featuring sophisticated red stitching, you are given an oasis of power and control. Customization is offered with the 8-way power driver’s seat and 4-way manual adjustable passenger’s seat for optimal positioning. Enjoy a difference of opinion regarding cabin temperatures thanks to the optional Dual-Zone Automatic Climate Control. Organize your cargo through the bench seat with underseat storage as you make room for just about anything. Sit back in supreme comfort as the power moonroof opens up to a source of fresh air and natural light. The 2017 Toyota Tundra TRD Pro comes in three advanced exterior shades, Alpine White, Cement Grey and Barcelona Red Metallic, reflective of the durable and high-quality design being presented. Modern durability and iconic power are revealed through the Toyota heritage front grille with chrome front and rear bumpers and 18-inch black alloy wheels. Dual exhaust and tailpipes add to the aggressive and athletic stance of the body profile as you escape in freedom and style. Expand your horizons in the 2017 Toyota Tundra TRD Pro as you drive without loss of communication. Through the advanced available Display Audio System, you are given access to a 7-inch touchscreen as well as hands-free calling and more through your compatible devices with the help of Advanced Voice Recognition Technology and Bluetooth Capability. Find your way with advanced awareness and direction through the AVN Premium Navigation System as you focus on the task at hand. Enhance your 2017 Toyota Tundra TRD Pro through a series of available Toyota Genuine Parts & Accessories as well as the TRD package options. Protection and refinement are elevated through the optional TRD Pro Carpet Floor Mats as you keep your interior looking fresh and clean. Embrace the rich racing history behind the TRD line of accessories and performance products as you enjoy the durability to the TRD Suspension kit and the refined feel of the TRD Pro Shift Knob. Perform with a standing ovation in the 2017 Toyota Tundra TRD Pro, where stamina meets intelligent engineering. Bilstein shocks and TRD performance parts enhance the already durable design of the Tundra for a resistance like none other. Benefit from a fuel tank skid plate, remote reservoir suspension and more for an exhilarating ride like you have never seen it before. Responsive handling and superior control are delivered through the available 6-speed automatic transmission as you tackle the road with handling you can rely on. Some conditions may apply. See Gateway Toyota for full details Edmonton, Alberta, Canada. Outlast every other on the road in the durable and refined 2017 Toyota Tundra TRD Pro. Featuring a long list of bests and a remarkable capability for more, this new Tundra model defies the competition and pushes onward to excellence at work or play. Test drive the 2017 Toyota Tundra TRD Pro at your local Edmonton Toyota Dealer – Gateway Toyota! 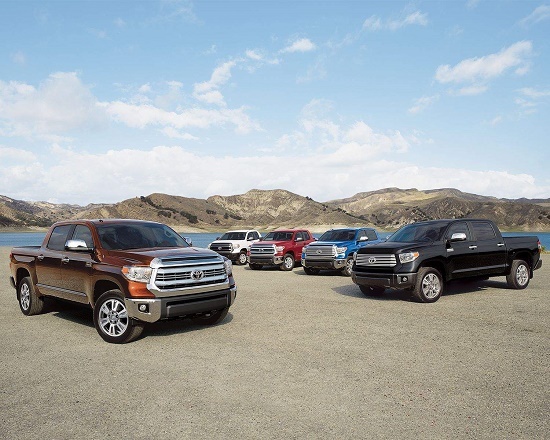 Gateway Toyota offers an extensive selection of new Toyota trucks, SUVs and sedans in addition to an extensive pre-owned inventory selection which will satisfy what you are looking for in your next vehicle!